And do not be afraid of those who kill the body but cannot kill the soul; but rather be afraid of Him who candestroy both soul and body in hell (Gehenna). 14 And death and sheol were cast into the lake of fire. This is thesecond death. Because of so much deception, please get the next scriptures and understand what True Love is. Notice againYahchanan 3:14, passed from death to life because we love the brothers (our neighbor). So, how are we required to love the brothers? Answer: Practice Righteousness. Who assemble and spend the night keeping memorials for the dead, who eatswine’s flesh, and the broth of abominable things is in their vessels. 21 Not everyone who says to Me; Teacher! Teacher! will enter into the Kingdom of Yahweh, but only he who doesthe will of My Father Who is in heaven. All religions and those who follow them are practicing iniquity today. It’s the cause of all problems, as you just read inIsayah 24:1-6. Prophecy shows that love has grown cold, as we see today in the acts of violence and retaliation, and the prospect of nuclear burning is imminent. The talk of this generation is nuclear war and each person thinks it won’t come near them. Well here, verse 11, She said, No man… She says no one condemns me. Then He said, …Neither do I condemn you… But notice, He said, …Go and sin no more… Yahshua is still saying, “Sin no more.” Is Penn State listening to that? Are the officials at Rome listening to Yahshua, Whom they claim to follow? No, they don’t claim to follow Yahshua. They claim to follow Jesus Christ. Who is Jesus Christ? It’s two Gods that used to be rabbis before they became known by that name. And, of course, they came out of the land of Egypt. It’s so ironic, you know. They don’t claim to follow Yahshua. If they even mentioned His Name, someone would probably want to stone them in their group. And Yahshua said, speaking to them, verse 13, Making the Laws of Yahweh of no effect through your tradition…Well, what was He talking about no effect? If you look over, hold your place, we’re gonna come back to it, look over toPsalm. Well, this is what Yahshua was referring to, Psalm 19. Yahshua was referring to this right here. This was what the Apostles spoke of also. It’s found in The Book of Yahweh on page 441. Psalm 19. Well, if you’ve found your place now in Psalm 19. I’ll read you the Scripture again in Yahchanan Mark 7:13. 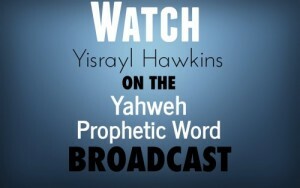 You’re,…Making the Laws of Yahweh of no effect through your traditions you have handed down! And many other similar things you do… You make the Laws of none effect. Well, what would be the effect of the Laws if they were kept? Psalm 19. I want to make sure that everybody gets thisPsalm 19. I’d like for you to read it. It’s very important that you read it. Psalm 19. And remember, He’s saying this is what occurred to Sandusky. Sandusky never had the Laws taught to him. Sandusky was taught that you should not keep the Laws of Yahweh. He was taught that all of that is done away. They made it of none effect. They make the Laws of none effect. Okay. Now you got that. Now, in Psalm 19:7. The Laws of Yahweh are Perfect, converting the whole person… If Sandusky had had the Laws taught to him diligently as a child and maybe some background before that, maybe a few generations before that of parents getting their hands on a bible and reading it, then Sandusky would have been in shape for Yahweh to judge at this time or Yahshua to judge. Well, of course, Yahshua would not judge him guilty. He would not condemn him as we just saw this in Yahchanan 8or John 8 if you have a King James Version. No, I don’t condemn you for this. So He turns to the Pharisees and said, you’ve made the Laws of none effect. He turns to Penn State or the Vatican and says, you’ve made the Laws of none effect. Verse 9, The Reverence of Yahweh is Clean… I don’t know why anyone in The House of Yahweh wouldn’t reverenceYahweh. It’s just beyond me that they would not glorify that Being day and night, wake up thinking about Him, go to bed thinking about Him and what He’s trying to do to a bunch of wicked sinners.